I point out a few items about these that “struck” to post. I mentioned Q had posted back on 7-24-18, but I never did much Q posting after that. The one here is a BIG posting from the latest Q’s. 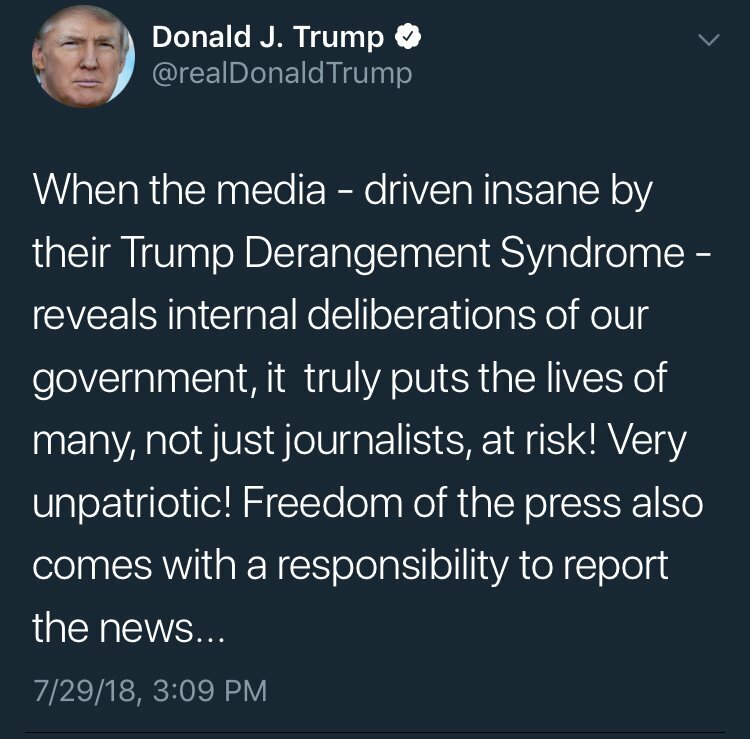 These posts are centered around “calling out the MSM topics, and there are indeed quite a few of them. From these postings, it is quite apparent that the MSM is in the “kill box”, and in one way or another, will be called out and taken down (whatever that means). Recall that some polls have shown that the MSM “trust level” is at it’s lowest point ever (link (sorry, it’s a 2016; there’s a more recent poll that shows the same type of thing)). And for good reason. All I can add to this is the phrase, “Use that Higher Discernment, baby!” (namely, see what resonates; at least that’s how it works for me). 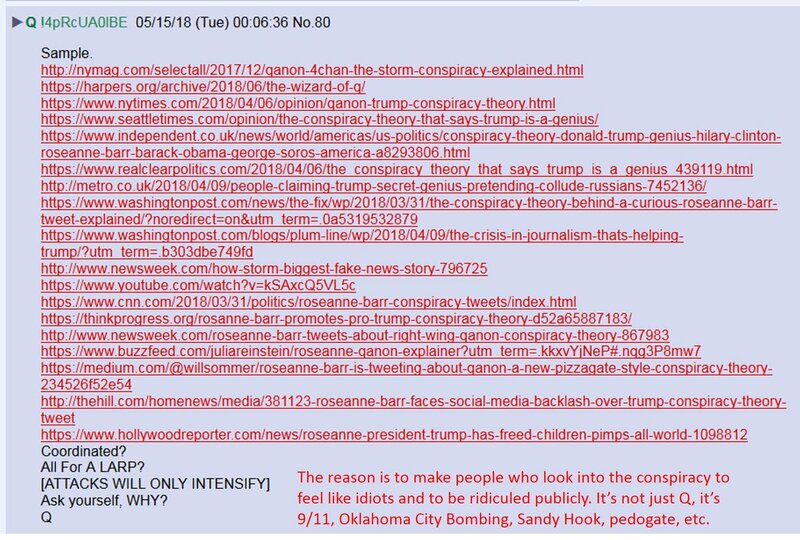 “ [Refers to a long list of MSM links denigrating Q from 5-15-18] All for a baseless conspiracy? Enjoy the show… [another new long list of MSM anti-Q links]… Something BIG is about to DROP. “ There is no greater [current] threat to the American people than the FAKE NEWS MEDIA… Study Nazism. Compare/contrast ANTIFA… SOCIALISM push… Who financed then? Who is financing now? Dark to LIGHT. GOOD WINS. “ You are witnessing/watching the systematic destruction of the OLD GUARD. POWER WILL RETURN TO THE PEOPLE. “ FISA = START [of the full disclosure-fall of the MSM/D party(?)]. FISA = IMMEDIATE CONF OF ILLEGAL ACTS RE: SIGNERS. FISA = IMMEDIATE CONF START OF HUSSEIN SPY CAMPAIGN TO RIG AN ELECTION WAS BASED ON FALSE INFO. FISA = IMPLICATES HRC / D PARTY AS FEEDERS OF FALSE INFO W/ THE INTENT OF SECURING MSM + BLAST/INSURANCE… FISA = TIES MSM HEADS (TV/BEHIND/CORP) TO D PARTY OTHER FOREIGN HEADS OF STATE IN CO-OP STRATEGY. FISA BRINGS DOWN THE HOUSE. “ NO MATTER WHAT HAPPENS THE MEDIA WILL NOT PUSH THE TRUTH. MSM IMPLICATED IN HIGHEST LEVEL TREASON EVENT IN US MODERN DAY HISTORY… DO YOU NOT UNDERSTAND/COMP WHAT WE ARE CURRENTLY DEALING WITH? PEOPLE ARE DYING… THOSE WHO YOU TRUST THE MOST ARE THE MOST EVIL. THIS IS NOT A GAME. HUMMANITY IS AT STAKE. “ [Begins with link to MSNBC hit piece against QAnon apps (Ali Velshi)] They do not want you asking questions. They do not want you thinking for yourself… They want you asleep. They want you blind. The message must bypass the MSM. It is the only way. People UNITED hold the power. Think election 2016. Power shall be RETURNED to the PEOPLE. “ Every C_A/MOS [MOS = Mossad?] tactic of infiltration and internal disruption is being deployed on this board (central hub). The World is Here. Recognize. This movement is bigger than anyone can possibly imagine. Peace through strength. Gallery | This entry was posted in apocalypse, cabal, energies, new energies, partners in contrast and tagged Main Stream Media, MSM, Q, Q Anon. Bookmark the permalink.